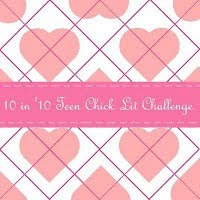 I saw the link to this over at Do Nothing But Read Day - 10 in '10 Teen Chick Lit Challenge. (Yes, I do notice a lot of fantasy on there.) I'm sure it'll shift/expand/contract. But that seems like a good start. So glad to have you aboard! And LOL on the yarn. My lighter side usually involves cupcakes. :-) Can't wait to chat about what you thought of your challenge books!